Poor Clare Colettines retain the traditional habit, night rising, perpetual fast and the observance of papal enclosure. They also continue to go barefoot as a sign of Gospel poverty and in witness to the transcendence of God. Church of England. They are a a closed order, no visitors are allowed, they live a silent life of prayer. 1989 Herefordshire. 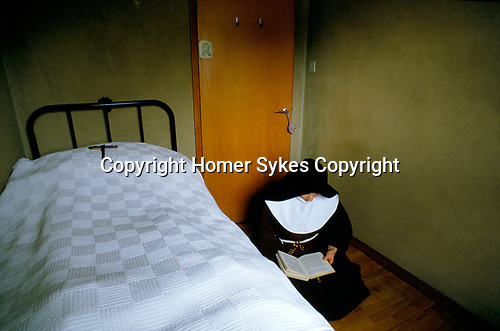 Sister Colette in her cell 1980s.